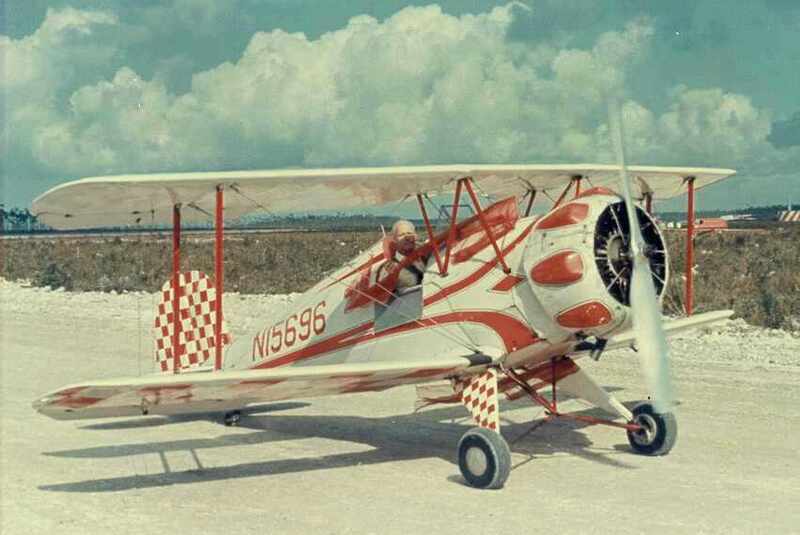 This tiny airplane had a huge chapter in the history of Aviation. Designed to push the absolute maximum of the specifications to limit aircraft performance in the Versailles Treaty that ended WWI, the Jungmeister (Young Master) along with the two seat version Jungman (Young Man) trained a large percentage of the Luftwaffe that beganm the air war part of WWII. 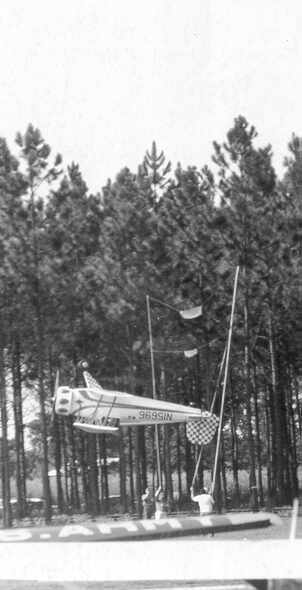 The Bücker's aerobatic capabilities were so good that the rules for acrobatic competition severely penalized anyone competing in this single seater. 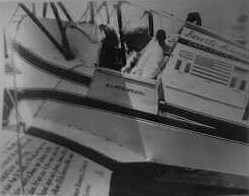 "Bevo's" Jungmeister came to the United States aboard another legendary aircraft, the airship Hindenburg as part of Germany's public relations efforts to show off it's advanced aviation capabilities prior to WWII and the fiery crash of the airship on a subsequent flight. 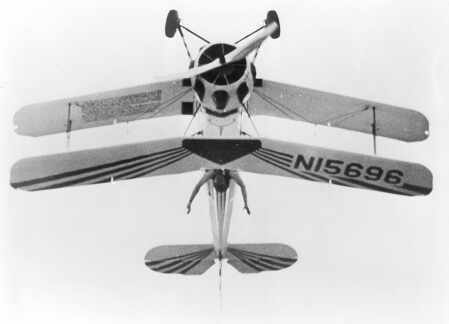 The Bücker's pilot, Alex Papana, pushed his signature ultra low level inverted pass a bit too far, made rudder contact with the ground, and, while he survived, reduced this model to rubble... rubble that was purchased by Mike Murphy who restored it and had a successful aerobatic career flying it. 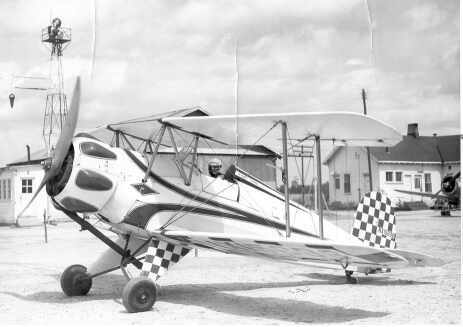 Bevo purchased Mike's Bücker in the 1946 after winning the World Aerobatic Championship several times flying his "Clip Wing" Piper Cub, but the first time he flew it in competition, the original Siemans radial engine failed catastrophically, and he had to borrow his old Cub to compete, and win, that year's competition. That was the last straw for the cranky old engine that had no support following Germany's defeat in WWII, and he elected to replace it with the slightly larger American built Warner Scarab radial. The picture on the left is on takeoff. The Bucker was so good at snap rolls that they began every exhibition as soon as the wheels cleared the ground. 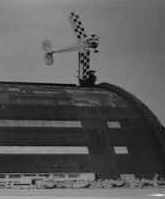 In addition to the violent roll, it would stop most pilots in their tracks as the ship would appear to come to a complete halt fifty feet above the runway when the roll completed. I include this color ground shot of the Bücker because of the many requests that I receive for details about the ship as he flew it. 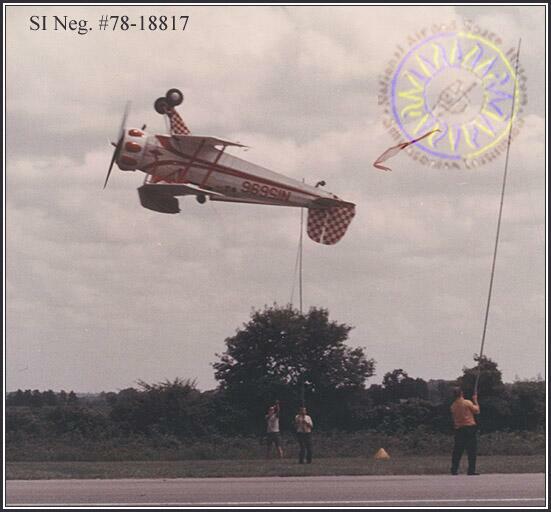 This color image is the best example that I have of the color scheme, including the fact that the bottom of the lower wing consists of a red checkerboard pattern in contrast to the "sun burst" pattern on the top wing (not visible) This paint pattern contrast made it easy for spectators on the ground to perceive the aircraft's attitude while observing the plane in acrobatic flight. I also found an excellent, high resolution color picture of the ship taken by Chuck Ross in either 1966 or 1967 at Fort Rucker, Cairns AAF, a day or so before the Armed Forces Day airshow. I have, with Chuck's permission, included it on this site at full (300k) resolution for those who would like the best possible record in color but not added it directly to this page because of it's size. Click on the image below to load that picture, but, know, that if you are using a modem connection, the image will take several minutes to load. I also include the following based on the surprising number of requests that I have received concerning the paint schema on the Bücker after I originally posted this page. The one thing that I did not remember were the "wings" on the Esso logo. 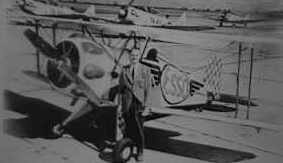 Note, also, the AT-6's (on the ramp at Spence Air Base) in the background which date this image to the early 50's which was the last time that he carried any commercial logo on the aircraft. In the only image that I could locate of the right side of the aircraft with a logo, it was simply the word "Esso" with no circle nor wings. The side view shows the "story" of the aircraft on the lower wing which was added around 1960 and the flag logo's that show the countries where the aircraft flew exhibitions. In addition, the cowling and engine differences with the Warner installed are clearly visible in the color picture above, notably the short exhaust stack, metal propellor, but, most notably, the fact that the cylinder head "blisters" do not match the engine cylinder positions because of the expansion patch added to the bottom of the cowl to accommodate the larger engine. The Bücker also had an innovative, lever positioned pilot's seat that had almost a foot of vertical travel which allowed the pilot to easily raise his head for maximum visibility or lower the seat far into the cockpit to help shield the pilot from the harsh environment of open cockpit flight. The landing gear is also often misrepresented in many reproductions since, on the ground as shown in the color photo above, the "oleo" struts that extend from the bottom of the gear fairings are fully compressed and the wheels are shown almost a foot further apart than they are when extended in flight, giving it a distinctive "bow legged" look, visible somewhat in the "hands off" image below when in flight. Note, also in the color photograph, the red cheesecloth ribbons snagged during the inverted pickup on the landing gear fairing and fuel gauge in front of the windshield... the fact that both ribbons are on the aircraft indicate a rare failure as his goal was to leave the top ribbon that is shown hooked on the landing gear fairing between the support poles back at the runway. The ribbon pickup poles were originally bamboo with brass joints that fit into holders in the rear fuselage for transport to and from exhibitions, but these were replaced around 1960 with nested aluminum sets that were a few feet higher than was possible with the bamboo. While I remember one case where he contacted, and shattered, one of the wooden poles, I don't think he ever came in contact with the metal ones. While it was not obvious to spectators, the poles were not placed in the center of the runway as expected, but with the ribbons centered over the edge between pavement and sod. This made it visually very easy for him to align his path by flying down the edge of the pavement and concentrate only on the height of his inverted approach. During the last decade that he flew, he used not one ribbon, but two. One at the top of the poles and one about 1/4 down from the top. 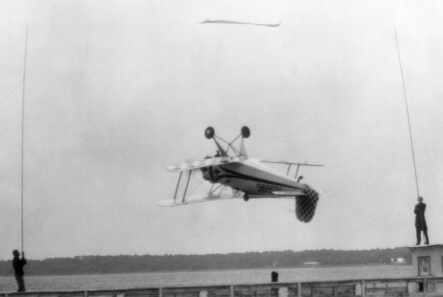 The use of two ribbons resulted in an incident during a show off of Charleston's "Battery" (the city's sea wall) where he completely missed the single ribbon by flying below it, almost hitting the pier walkway where the guys with the poles were standing on top of the the railing and small ticket house. 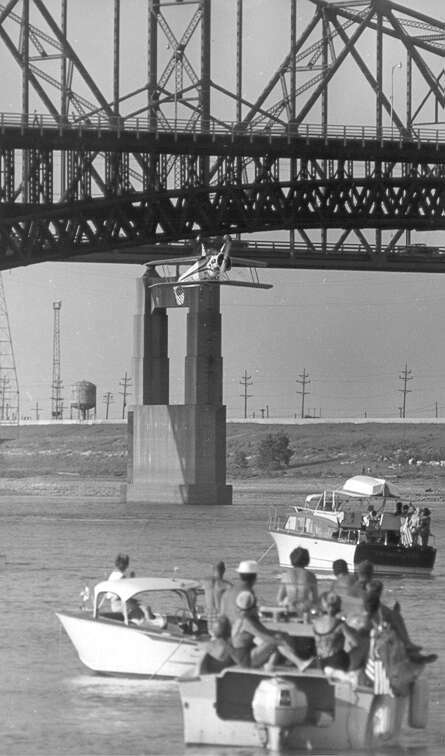 He finally realized that he had not misjudged his altitude as he initially assumed, but rather, had forgotten to take the harbor's tide level into consideration when he had initially planned his approach to the elevated pier. Among the photographs that I have are grainy blowups of this specific pass that he apparently used to evaluate what happened and ultimately confirmed his precision... which, in turn, lead to adding the second ribbon and consistently taking out the bottom one while leaving the top one untouched. Another signature demonstration was a low altitude (under 100') inverted "fly by" with his hands held above (actually below) his head. The picture was taken by the photographer standing on the runway using a normal lens. It's not well known that this was also his "Ribbon Inspection Pass" during which he checked to see that the ribbons were up, ready and their exact location for the next inverted pass where he would pass between the poles on the ground. It was following this "hands off" pass that his fatal accident occured in 1971, during a charity air show in Greenville, North Carolina, when the engine failed as he cleared the airport boundary. If you do a web search on "Bevo Howard" it's his quote "Always keep an 'out' in your hip pocket." that comes up most often. He planned for emergencies and survived a number of them, especially engine failures. In this case, the key to making a low altitude turn back to a safe landing area following an engine failure is keeping the nose low to maintain sufficient airspeed to complete it safely. However, while the field he was over appeared empty, halfway through the turn back to the airport, his lower wings struck the upper branches of the lone bare tree in the center of the field. The mechanics at Hawthorne Aviation in Charleston completely rebuilt the aircraft (restoring it to non flying condition) which was then turned over to the Smithsonian Aviation Museum and is, as of this writing, on display at the Smithsonian's Silverhill restoration site. The Buecker is in the news again. 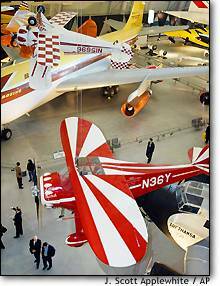 The new Smithsonian Udvar-Hazy Center located on Dulles Airport outside of Washington, DC is opening this month (December, 2003) and the ship has appeared in a number of the news photo's of the preopening event. This AP shot was featured on the MSNBC news site and there were additional pictures in a "slideshow" where it's distinctive pattern highlighted it's inverted flight inside of the new building. The following drawing is from an original German sales brochure for the aircraft, showing the original Siemens Engine exhaust stack and smaller diameter cowling.